Massimo Polledri, member of the Italian Parliament, has called on the parliament of his country to assist in the release of Dr. Biscet. Parliament responded today, claiming that they are officially committed to fighting for the release of Dr. Biscet and all of Cuba’s political prisoners. God bless Polledri and all who fight for this cause. In December 2010, the Italian doctor and Parliament member, Massimo Polledri, penned a letter to the Italian Foreign Relations Ministry so that Italian governors and politicians could join the efforts of the Freedom for Dr. Biscet Campaign. Dr. Biscet is a Cuban doctor of the black race, leader of the peaceful movement of civil right who is struggling to establish a state based on fair laws in Cuba through non-violent civil disobedience. He is the president of the Lawton Foundation for Human Rights, an organization founded in 1997, which is considered illegal by the Cuban authorities. Dr. Oscar Elias Biscet was released from prison on October 31, 2002 after serving three years in a maximum security prison for peacefully protesting in favor to defend human rights. Thirty-six days after his release, he was arrested again in Havana when he was about to meet with a group of activists to discuss the subject of human rights. He was locked away in a cell with common criminals. While in prison, He was included in the repressive wave of the Cuban government carried out against 75 independent journalists, editors and human rights defenders, which took place between the months of March and April 2003. All were sentenced under rapid and unjust trials, and were imprisoned for terms up to 28 years. Since 1998, this doctor has suffered physical and mental torture in various prisons for refusing to follow the disciplinary measures designed for the common prisoners. Dr. Biscet is a political prisoner of conscience and demands to be treated and considered as such. He is currently serving a combined 25 years in the Combinado del Este Prison, a maximum security prison in Havana. Dr. Biscet is an example of human rights violations suffered by all those who dare to defend the Universal Declaration of Human Rights in Cuba. Dr. Biscet has been arbitrarily imprisoned 26 times by the Cuban government in a matter of 16 months–from July 9, 1998 to November 3, 1999. He has been incarcerated in jails where depravation is rampant, he has been denied light and food, and has been mixed with prisoners who are either mentally insane or who are criminals. Most times the government has not informed the family of his situation. Dr. Biscet was brought to trial on February 25, 2000 for announcing a peaceful march along with other human rights defenders which coincided with the Ibero-American Summit in Havana in 1999 where he gave a press conference in which the Cuban flag were exposed upside down as a protest for the human rights violations in Cuba. Dr. Biscet was accused of “dishonoring national symbols”, of”disorderly conduct” and of “incitement to criminal conduct “and was sentenced to three years in prison under these pretexts. He was later moved 450 kilometers east of Havana to “Cuba Sí”, a maximum security prison in the province of Holguin, far away from his family. On April 7, 2003, Dr. Biscet was subjected to a trial along with 75 other activists and was sentenced to 25 years. He was transferred to “Kilo 8” prison in Pinar del Rio, where he was confined from November 13, 2003 to January 15, 2004 in a basement cell. Since then, on December 1, 2004, Dr. Biscet was transferred to the Combinado del Este Prison in Havana, where he is currently detained in inhumane conditions. During all these years in prison, Dr. Biscet has refused to comply with any applicable rule or provision imposed by the penitentiary judges to common prisoners and not applicable to a political prisoner of conscience. For example, he refuses to wear the uniform of a common criminal and refuses to abide by the imposition of greeting prison officials. For this reason, the judicial authorities have violated his (supposedly) mnadatory rules of prison visits, have denied him the right to write to his family, and to receive or make phone calls. Dr. Biscet is in a delicate state of health because he suffers from hypertension, chronic gastritis, cholesterol, and a gradual loss of vision, all of which he never previously before suffered from. The hygienic conditions in the prisons he has been in have caused him injury to his epidermal cells. He has also lost most of his teeth due to a severe gum disease that requires urgent treatment. Dr. Biscet has won numerous awards in his fight for democracy. First, The U. S. International Republican Institute Award for Popular Democracy was given to him on February 5, 2003. In November 5, 2007, he was the recipient of the Presidential Medal of Freedom, the highest civilian honor in the United States. On December 12, 2007, Germany granted him the “Dr. Rainer Hildebrandt recognition”. Similarly, the Czech Embassy in Washington DC paid tribute to Dr. Biscet on February 27, 2008. The Life Science Association Pontremoli – Lunigiana (Italy) named a literary award in honor of Dr. Biscet. Dr. Biscet is one of several Cuban political prisoners who will only accept an unconditional release and will never agree to go into forced exile. More than 50 political prisoners were released and deported to Spain during the months of July to October 2010 after the Catholic Church entered agreements with the Cuban government, achieving to release political prisoners only if they accepted exile. Many of the Cuban passports of these political prisoners and their families (children) have been printed by the Cuban government with the words “final exit” on them. These political prisoners have never been forgiven of the “crime” they never committed and the unjust sentences imposed by the Cuban courts have never been cleared. Is the government following the situation of Dr. Biscet and other prisoners of conscience of the Castro regime? What steps can and should be taken at the international level to support the campaign for the release of Dr. Biscet and all those who, like him are fighting in Cuba in a non-violent way for the affirmation of fundamental rights and are paying first hand for this under the repression of Castro? A couple of weeks ago, Oscar Haza conducted an excelent interview with Dr. Oscar Elias Biscet for his program on channel 41, “A Mano Limpia”. Dr. Biscet spoke directly from prison, via phone, and touched upon his current conditions, his hope to soon see a free Cuba, and reassured that he will not cease his pacific and pro-democratic projects once he is released from behind the bars. The Italian pro-life association, “Scienza & Vita” (Science and Life) has named an award in honor of Dr. Oscar Elias Biscet. The prize was recently awarded to two Italian journalists. The president of the association, Dr. Cristian Ricci, granted us an interview in order to explain his decision of choosing the name of Dr. Biscet to represent such an award, while also telling us what his organization is about. It is another act of international solidarity in favor of the liberation of Dr. Biscet and the freedom of Cuba. Pontremoli – Lungiana Scienza & Vita (Life & Science) Association is a local association that belongs to the federation of associations known as Scienza & Vita. In Italy, there are more than 100 of these groups. The purpose of the association is to defend life from the moment of conception to natural death, through a cultural battle. Why has your organization decided to name this “Premio Letterario” after Dr. Oscar Elias Biscet? We believe that to defend life it is necessary to reaffirm the true talent of femininity- the ability to give life. 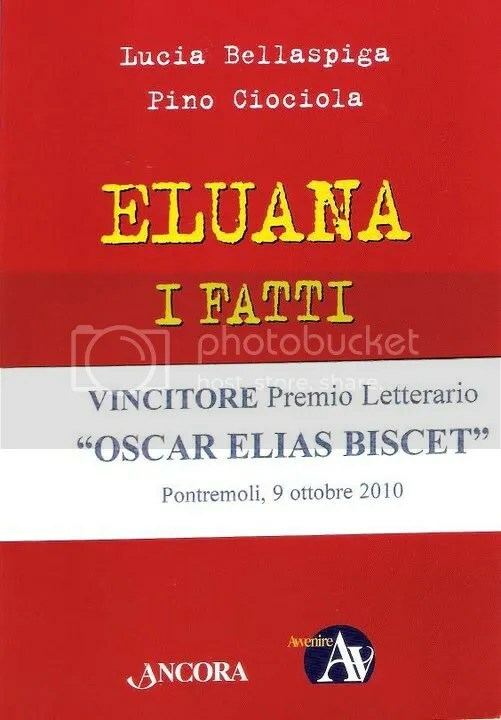 With this in mind, for 2 years now we have established a national literary prize named “Donna è Vita” (Woman is Life), and within the various categories, this year we awarded the “Literary Prize Dr. Oscar Elias Biscet”. With this prize, we aim to recognize the value which can be revealed by books, which, through evidence and facts, prove that the “right” to die is an ideological creation and does not accord with what is fully human. How did you become aware of the situation of Dr. Biscet? I discovered the story of Dr. Biscet thanks to the efforts of other Catholic Italian associations. Such associations are bringing the story of this great man to light. Please explain to us about the recipients of the prize this year and why they were chosen to be awarded. The winners are two Italian journalists, who write for the newspaper Avvenire. They are Pino and Lucia Bellaspiga Ciociola, who in 2009 published the book “Eluana. The Facts” which told the sad story of Eluana, also known as the Italian Terry Schiavo. Indeed, in 2009 in Italy, the first girl was killed by euthanasia. The authors have shown that her “desire” for death was actually artificially constructed. These authors have defended life, like Dr. Biscet, against judges and politicians. They have shown that euthanasia is not natural for human beings and that, overall, laws which go against life are inhumane. The winners, in respect of the human truth, were able to face the current with courage, just like Dr. Biscet. Who has previously been awarded? In 2009 the Literary Prize “Donna è Vita” (Woman is life) was awarded to the book: “The strength of a fragile life” by Sophie Chevillard Luz. It is narrated with the voice of courage and love that a mother shows to her daughter, who was born with a serious malformation and that doctors wanted to abort. As we know, Dr. Biscet is currently in prison for defending human rights. If you had the chance to speak to him, what message would you like to give him? 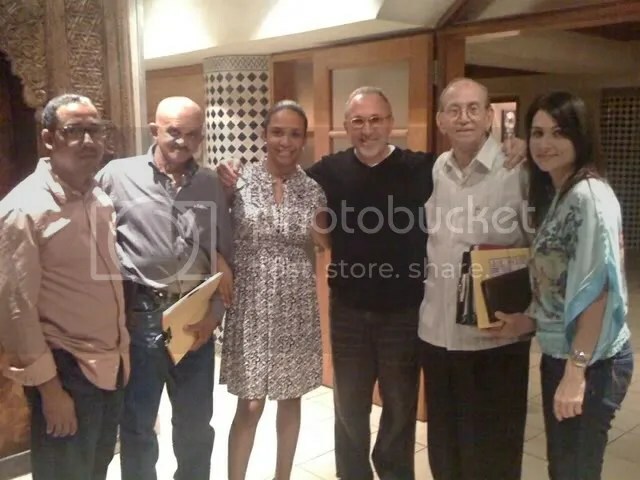 Dr. Alberto Fibla, former Cuban political prisoner for 28 years and the president of the Campaign for the Liberation of Dr. Biscet, has written a flawless summary of a piece of great news in regards to the campaign – the sponsorship and solidarity of the grand Cuban musician and businessman, Emilio Estefan. The recently established Campaign for the Liberation of Dr. Biscet has just taken a great step forward in the accomplishment of a long list of goals. Various members of the Campaign have met with the distinguished businessman Emilio Estefan at his offices to discuss the objectives of the group in regards to the liberation of Dr. Oscar Elias Biscet and the rest of the Cuban political prisoners. The warm welcome, on behalf of Emilio Estefan, has been beyond marvelous. I think a better word to describe it would be sublime. And this easily be understood right away when one meets him. Emilio harbors a profound devotion for the Country, which is evident to those who meet him. This is a virtue worthy of praise. That is why we all understood each other so well, to the point that he quickly offered us to be the sponsor of the Campaign. It is clear that he is a man who values time in terms of minutes and seconds, which is perhaps how he has reached the summit of success in his career. In truth, it is very satisfying to have met a man like him. At one point in the meeting, we walked into his ample recording studio. We members of Biscet’s campaign then recorded our faces and voices into a camera for a short film soon to be published on our official web site. In a clear sentimentally driven speech, Winnie, the daughter of Biscet and the most relevant pillar of our campaign, told the cameras, “They robbed me of my father simply because of his beliefs in freedom. I am only asking for help from generous people.” She then finished off her part by saying, “silence is freedom’s worst enemy,” a phrase which each member of the campaign members repeated in their own interviews, including our proud sponsor, Emilio Estefan. These words have remained as the slogan of the Campaign, because it is known that the achievement of freedom requires voices, and requires screams. It requires ideas that could speak and scream, for a silent country is an enslaved country, victim of the most brutal form of oppression. At 6pm on Friday, November 19th, Telemundo (Channel 51) will air a very personal interview of Winnie Biscet with the acclaimed Cuban journalist, Ambrosio Hernandez. 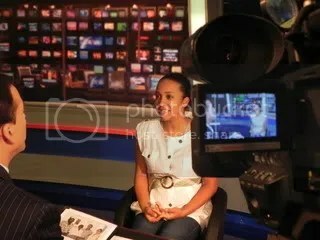 During the interview, Ambrosio expressed his profound respects for Dr. Oscar Elias Biscet and all the Cuban political prisoners, as he attentively listened to the emotional words of Winnie, while they both went through family photographs of Biscet in Cuba, before his arrest. Winnie explained the details of the campaign for her father’s liberation, his current condition behind the bars, and the difficulty her family has had to face during the elongated imprisonment of Dr. Biscet. Winnie Biscet and all the members of the campaign are extremely grateful of Ambrosio Hernandez and Telemundo 51, as they have offered us a once in a lifetime opportunity. Don’t forget to tune in on Friday night at 6pm. Winnie Biscet has informed us that her grandmother, Hilda Gonzalez (mother of Dr. Oscar Elias Biscet), is currently in a critical state of health, remaining in bed while she suffers from a chronic depression since she does not know what will be the fate of her imprisoned son. Due to his choice of not accepting exile from his country in exchange for his liberation, Biscet, together with 11 other political prisoners of conscience, have remained locked away behind the bars. Recently, 2 other prisoners from this group, Luis Ferrer and Arnaldo Ramos, were released- Ramos with an extrapenal license, “unconditionally”, and with the opportunity to remain in Cuba, while Ferrer has chosen to take the path of exile towards Spain, along with his family. The uncertainty which hangs over the family of Biscet has dramatically affected them, pushing his elderly mother to the point of desperation. Ironically, today, November 17th, is Hilda’s birthday. But she will not spend it full of happiness, celebrations, and good times. Instead, this humble woman will have to continue praying to God that she could soon see her son, and her country, in freedom. From all of us at this blog, we would like to wish her, within the context of her situation, a very happy birthday, along with lots of good health. We would also like to let her know that we will pray for her critical state and for the situation of her son, along with the rest of the prisoners of this group of brave fighters. God bless Mrs. Hilda Gonzalez, her family, Dr. Biscet, and all the political prisoners of Cuba.